Mr Dean Gardiner, the brother of Jonny Gardiner (proprietor of the Rock God Music School, situated around the corner from us here in Wyoming NSW), recently took delivery of his Blue Mood 18W 6V6 amp head, by the Richards Amplifier Company – Australia. Naturally, when the day came for Dean to pick up his new amp, we took it around to the music school auditorium, so the two brothers could give it a good blast. The photos show Dean’s new Richards amp sitting on top of Jonny’s favourite well played in Marshall 4×12 speaker cab, but we demo’d the amp through a variety of differently voiced speakers. Some amps only sound at their best when connected to specific models of speaker, but this amp sounded great connected to any speakers we had access to. We originally discussed the assembly and design concepts of this amplifier in some detail in our earlier blog dated July 17th, 2012. There are two important details that differentiate this example of the Blue Mood series amps from other custom orders, apart from the choice of 6V6 output valves. Firstly, this amp includes the optional extra of a valve-driven FX Loop, please see the original blog. Secondly, Dean chose the Mercury Magnetics reproduction of the original Fender “Brownface” DeLuxe 6V6 audio output transformer. This transformer has only a single 8 ohm secondary winding, so there is no impedance selector on the rear panel as per most models. However, this limitation is more than compensated for by the trademark Mercury sound that is smooth, exceptionally musical, warm and balanced. Sweet, rich, detailed and seductive ! So………………what is the intention of the Richards Blue Mood series amps ? 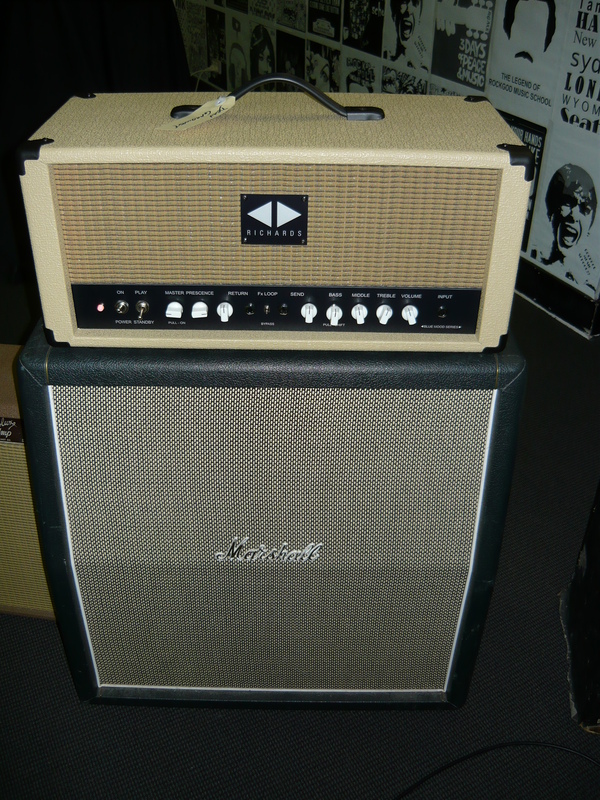 To equal or surpass the tones of the great late 50’s tweed and the early 60’s blonde and brownface guitar and bass instrument amplifiers. The Blue Mood gives you finer control over your tones and less power supply noise than the originals. The amps are designed around 6V6 or 6L6 power amp stages, although we do also build a 30 watt EL34 model with a more ‘British’ voicing, as a tribute to the great TW style amps. In the latter case, the control panel and chassis layout remains unchanged. The EL34 model will be the subject of a forthcoming blog. Regards – Ivan R.
This entry was posted on December 10, 2012 at 10:28 am and is filed under Amps, Friends of Ivan Richards Audio. You can follow any responses to this entry through the RSS 2.0 feed. You can leave a response, or trackback from your own site.